Setpoint Systems is growing and has hired several new employees. This quarter we have held two new employee training classes. The first class consisted of two service account managers and one construction account manager. They focused on estimating and sales. Our second class had a variety of different positions: two techs, one engineer/estimator, one inside part salesperson, and an engineering aide. After the main training was held, they worked with their individual groups to receive specialized training. All of these employees completed five weeks of extensive technical training, product training, company culture review, plus learned our processes, procedures, and standards. In addition to classroom training, readings, and homework exercises, they earned a “Masters” level on Delta Controls “George University”. Cody graduated from SCIT in Anaheim, California, and earned an associates degree in electrical engineering. After earning his degree, he moved back to Minnesota and worked as an electrician at various Minneapolis construction sites for a year. Later he moved to Texas and worked various jobs while he figured out life. He is still working on the meaning of life and will share it as soon as he does. Cody has been picky about his jobs and was excited when he saw Setpoint’s ads. He researched our company and thought it would be a good field to be in because of controls. He enjoys the atmosphere and culture of our company. It’s everything he hoped for, and he is looking forward to completing training. Cody will be working with Ryan in our Minnesota office. He has been married to Sidney for two years, and they have a 15-month old son named Owen. Owen is his passion. Owen walks, talks, and runs… Cody watches a lot of Owen TV when he gets home. James earned his bachelors of science in mechanical engineering and graduated from the University of Kentucky in 2016. After graduation, he worked full-time for the company he was interning with to be a quality/manufacturing engineer. While James appreciated the job, he didn’t feel like he was able to move forward or to think critically. He was looking for a challenge and an opportunity to gain experience. His plans after college were to find a full-time engineering job, preferably in Colorado. After he initially spoke with Sheri about the culture and what he would be doing at Setpoint, he was intrigued. During his interview with Sheri and Jon, they made him think critically about what he would be doing at Setpoint. He liked the way Setpoint challenges and empowers their people. He decided it was the place for him. As part of the offer, Setpoint flew James to Colorado and had him stay in the company condo while he did his five weeks of new employee training. This made him appreciate how the company invests in their employees. After the training program is complete, he will be relocating to the Denver area. James loves snowboarding, hiking, camping, and biking. He has a lot of friends in Colorado that he met while he was in the University of Kentucky ski club. Since there is no shortage of things to do in Colorado, he is looking forward to exploring. Tammy loves doing controls and is excited to be joining Setpoint Systems. She has been in HVAC for over 25 years. For the past ten years, she worked as an HVAC Service Tech until she was introduced to building controls. She loved it and said she discovered her passion. Tammy started taking over the building controls and was subcontracted out to other HVAC contractors through her last employer. It was quite the experience, and she gained extensive knowledge about many different systems and their controls. She has a lot of hands-on experience and believes in researching problems to achieve results. Tammy believes in strong customer service and often goes above and beyond to satisfy customer needs. She has been married thirty years and has six adult children plus three grandsons. She enjoys spending time with her family going camping, fishing, hiking, and many other outdoor activities. Her goals have been the same for quite some time—to have a dream job as a building automation programmer and to be able to share knowledge with her fellow workers. She is currently in college for her bachelors in information technology. She believes she will be a more valuable employee by combining her IT knowledge with her controls experience. 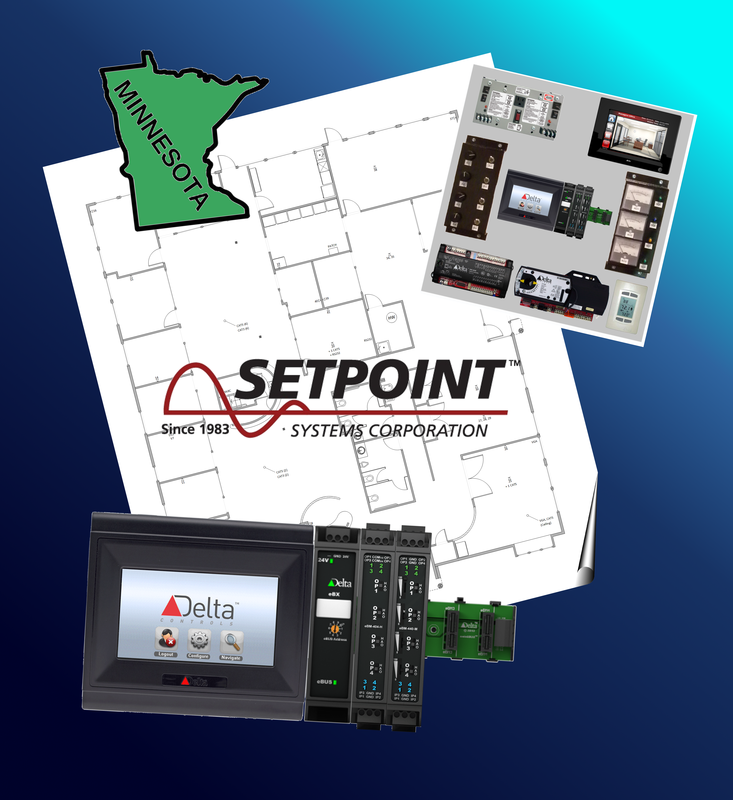 Tammy is really excited about the opportunity of working on Delta Controls systems at Setpoint. Stacy comes from a varied background but has been interested in the building automation services for many years. For the past six years, he was running a successful gunsmithing business but was searching for more stability at a company he could feel proud to work for. Setpoint fits the bill. From the time he could walk, he was on jobsites with his father’s construction company, doing everything from hammering a nail to building a 6,000-SF building from the ground up. This experience taught him hard work, tenacity, as well as the ins and outs of the trade. From there, he went on to a golf scholarship at Drexel University and focused his attention on computer information systems. He worked in the IT industry for over a decade and plans to blend this valuable knowledge and skills to build the Parts Department at Setpoint. Stacy lives in Conifer with his wife and young daughter. He enjoys golfing, shooting sports, hunting, and anything in the mountains. Kyle earned an associates degree in HVAC in upstate New York. He had been working in the Denver area for two years in the property maintenance field and was focusing on residential HVAC systems for multifamily housing. Kyle is now looking forward to this new challenge and views it as an excellent opportunity to adjust his career path. He is interested in energy management, working with controls, and learning more about the Internet of Things (IoT). He has been married for seven years to Natalie, and they have a furry kid named Jack. They enjoy hiking, camping, snowboarding, and exploring what Colorado has to offer. He believes Setpoint is a place where he can make more of a difference. It is a more important field and has a bigger impact on energy savings. Controls will play a critical role in energy management with our growing population and the effects of increased energy demands and the depletion of natural resources. This entry was posted in Meet Our Staff, Setpoint Systems News, Uncategorized on July 6, 2017 by setpointsystems. Jeff has been driving sales growth in the software and technology industry for the past 20 years. He believes that the key to his successful sales career has been to operate with integrity, love what he does, and never stop learning. As a customer advocate, Jeff’s goal is to identify opportunities for his customers to implement new and emerging technology solutions so that they can increase their operational efficiency while improving productivity and lowering costs. Jeff holds a bachelor’s degree in marketing from Metropolitan State University of Denver. He has lived in Colorado for 25 years and loves golfing, camping and hiking with his wife Stephanie and two children, Sarah and Ryan. His goal over the next few months will be to visit his customers and assess their needs. Joe was interested in sales at the beginning of his career and has three years’ sales experience. When his first son was born in 2005, he was attracted to the steady income that being an electrician would provide. He had always dreamed of learning a trade and was presented with the opportunity to train to become an electrician with the IBEW. He gained on-the-job experience while studying at night and earned his license in 2009. The main focus of the company he first worked for was tenant finish, but he always wanted to learn controls. He heard that Setpoint Systems was the company where he could gain that type of experience. So he joined us in 2014 as an electrician and then advanced to become a foreman in 2015. However, in the spirit of Miller Heiman, periodic changes are a great way to keep one’s organization healthy. Joe always enjoyed sales and believed that with his 12 years of electrical experience he would be an asset as a salesperson. So when he learned that Setpoint Systems was hiring salespeople, he applied internally for the position and made the switch. The idea that he could do something else inside of Setpoint Systems was a natural choice. Even while working as a foreman, Joe realized that working with customers was the favorite part of his job. Now he is able to bring that same enthusiasm to the Construction Account Manager position. He believes this is an exciting opportunity, and it is a natural progression in his career. Joe is looking forward to using his field knowledge to be a creative consultant and assist in solving issues that customers are experiencing. Joe grew up in Boulder, Colorado, and now lives in Arvada with his wife and two kids. He loves skiing and has already bought his family’s season pass for next year. He enjoys playing guitar and is into music of all types. He usually has several home improvement projects going at once, and he’s always trying to think of better ways to automate his backyard chickens’ environment. Nick has worked in multiple facets of the construction industry for four years, in addition to having six years of sales and marketing experience. For the past year he has worked as a Sales Project Manager for a small construction company. Prior to that, Nick worked as an Operations Manager for a property management company. One of Nick’s loves is baseball. He earned a scholarship to the University of Indianapolis and played Division II baseball as their catcher. He learned to deal with many personalities and how to work towards a common goal. He is excited to join the Setpoint Systems’ family because of their comradery and team atmosphere. He earned his degree in marketing and design. His sales strategy emphasizes customer retention, satisfaction, and building strong relationships. He enjoys interacting with people to determine what issues they are having and how he can help solve their problems. The most rewarding part of his career so far has been developing friendships with customers. Nick enjoys all the opportunities Colorado has to offer: snowboarding, hiking, fishing, and camping. He is originally from Bettendorf, Iowa and moved to the Denver area about two years ago. His small-town values will help him connect with Setpoint customers. This entry was posted in Meet Our Staff, Setpoint Systems News on April 28, 2017 by setpointsystems. Setpoint Systems Corporation is proud to announce some new employee additions to our already exemplary team. All four new team members have already earned their Master Certification in George U in an impressive 3-1/2 weeks. Please welcome them to our team. Jeff has worked in construction for 16 years, primarily as a General Contractor. Most of his career has been in estimating. Some of the projects he’s worked on include the Colorado capitol building, the Children’s Hospital, plus several other hospitals, schools, and most major universities throughout the metro area. During his freshman year in college, he went to Nebraska for one year on a baseball scholarship. However, he missed the mountains and returned to Colorado to get his degree at Colorado State University in Construction Management. Jeff is a native Coloradan who enjoys snowboarding, camping, softball, and gardening. He has been married for eight years to Shaana. They have two kids, a 7-year-old girl named Adasen and a 4-year-old boy named Ethan. They keep him pretty busy. Jeff enjoys interacting with people and is looking forward to selling for Setpoint Systems. He is also looking forward to meeting Mechanical Contractors from a different angle. Jerome successfully completed our five-week Setpoint Systems training as well as achieved his Delta Control’s George University Master Certification, and has joined our office in Burnsville, Minnesota as the Service Account Manager. Prior to joining Setpoint Systems, Jerome worked in electronic component distribution for 16 years. Five years as a Tech Support Rep, five years as an Interconnect Product Manager, and the last six years as the Interconnect and Electromechanical Product Group Manager, where he and his team managed over 175 suppliers. Prior to that, Jerome was an electronic communication and security system technician in the Air Force. He has earned associates degrees in both Electronics and Business Management, and has also completed his Internal ISO Auditor Certification. He has been married for 22 years to Susan. They have one daughter, Emily, and two stepdaughters, Erica and Erin, plus eight grandkids. In Jerome’s free time, he enjoys woodworking, target practice, ice fishing, cooking, plus making beer and wine. Jerome, how about some samples? Rance has spent most of his career selling electronics recycling and end-of-life asset management recycling services with a local firm and as an independent consultant. During that time he spent one year in the technical training side of refineries and chemical plants out of Houston before deciding to return to Colorado. He holds a BS from Texas State University in Applied Sociology (research degree), as well as an MBA. He is an avid reader and has always been a geek when it comes to learning about new technologies and advancements in the science world. He currently lives on the west side of Lakewood with his seven-year-old boxer rescue dog and enjoys spending the majority of his free time snowboarding, hiking, camping, and fishing in the mountains. He is excited to join the Setpoint team as a Service Account Manager in Denver because the most rewarding part of his career has been establishing and maintaining meaningful relationships with clients, becoming a resource in solving their problems, and being a vendor who has made a positive impact on their organizations. He believes that he will be able to not only continue this career path here at Setpoint but expand and improve upon it for years to come. Buster is supporting the sales staff with estimating and will then roll into engineering projects. He has been in the temperature controls business for 23 years. During that time, he worked in purchasing, built panels, created job drawings in AutoCAD, designed and engineered projects, and estimated jobs. He also assisted in temperature controls installation, plus performed check tests and start up of systems. Early in his career, he worked for a defense contractor as an electronics technician on a missile program. Prior to that, he was in the Air Force as an electronics technician working on fighter/bomber aircraft. Buster has been married for 27 years to Elizabeth. They have a daughter, two sons, and two grandkids. He enjoys woodworking and gardening. He recently completed remodeling his kitchen and bathroom. Buster is excited to learn the Delta Controls System and is happy to be part of Setpoint Systems. This entry was posted in Meet Our Staff, Setpoint Systems News and tagged Setpoint Systems Corporation on June 14, 2016 by setpointsystems. Minnesota Open House- Thank You! Early this month we had our open house at our Minnesota office, to celebrate the grand opening of our new state of the art facility. We are so thankful for everyone that attended, our Minnesota team had amazing conversations with all each and every one of you. We are excited about putting down more permanent roots in the community, and are looking forward to the opportunity to better serve many of our long-standing customers in the greater Minneapolis area. Our new office building has just been renovated to include a new, state-of-the-art controls training facility, complete with the latest DDC technology available. There, you’ll have the opportunity to attend monthly training classes on HVAC and controls theory, Delta controls product lines, as well as many other customized courses we’ve created to respond to your BAS needs. Setpoint Systems has always been just a phone call away. But now, our team of Delta Controls Master Certified Account Managers, Engineers, Project Managers, technicians, and OSHA-30 certified installers are now just a few minutes drive away from your site. We hope you will join us for our open house – you are a key part of our success and the reason for our investment in Minneapolis! We look forward to opening our office together! At Setpoint Systems Corporation we believe: Collaboration. Training. Listening. Empowered these are words that go far beyond marketing, they are the foundation of our organization; we strive to understand your challanges and goals, and together develop solutions that are right for you. This entry was posted in Setpoint Systems News on May 2, 2014 by setpointsystems. In a few weeks, Setpoint Systems will be opening our new branch office in Burnsville, Minnesota (near Minneapolis). We’re very excited about bringing our high standards and unique solutions to customers in that part of the country. We’ve already been serving customers in Minnesota, Ohio, and many other states. With the opening of this office, we’ll have Account Managers, Technicians, Engineers, Foremen, and Installers ready to serve existing and new customers. In addition to that, we’ll have a state-of-the-art training center in the Minnesota office. Our new training center will supplement our existing centers in Colorado and California. We’re using the latest controllers available from Delta so you can receive the most up-to-date training possible utilizing the newest technology available. Very soon we’ll be posting a Minnesota training schedule, so stay tuned! First things first though–we have to dig out of the snow there and make sure the new office is ready to go. This entry was posted in Delta Controls, Setpoint Systems News, Training Department on February 21, 2014 by John Becker.